The complete set of diagramming features for a Silverlight application. 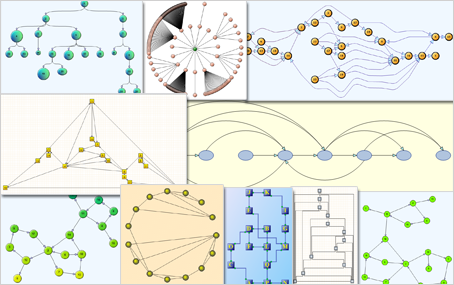 With Diagramming for Silverlight you can choose among more than 100predefined node shapes. If you haven't found the the right one you can create your own shapes and shape libraries. Among the diagram elements are tables, whose cells can span several columns and rows as well container nodes. Diagram elements can be rotated at arbitrary angles and you can use any Silverlight control as a diagram node. TreeView nodes are indispensable when you build data hierarchies. Each link can have multiple segments that can be straight lines or curves. When styling the diagram MindFusion.Diagramming for Silverlight makes sure you are totally in control - you can change even the smallest detail at the diagram. Nodes support custom painting and shadows. You can also create transparent and invisible nodes. Text can be laid out in polygonal areas and styled HTML-like text formatting is also supported. You can change the Z-order of any diagram element. The control supports background swimlane grid. 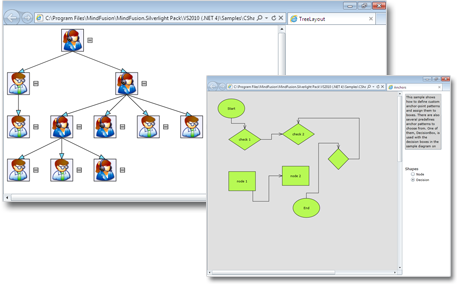 When it comes to arranging your diagram automatically, the choice is simply stunning - you have more than 15 automatic graph layout algorithms, each of them with many options for customization. Each layout is very easy to apply giving you the possibility to change dramatically the appearance of your flowchart with a mouse click. Automatic routing for the links is also supported. The component boasts a big range of user interaction options - from copy and paste to scroll and zoom and to undo and redo. You can define tool tips and select multiple items at once. You can use the node alignment guides for easier arrangement of your nodes. There are several user interaction modes, panning is also supported.